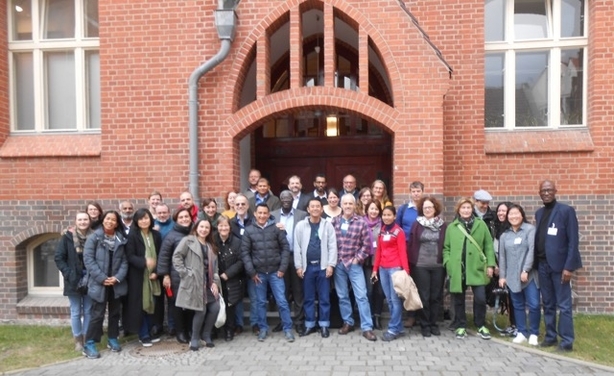 Berlin Meeting on "Transforming Tourism"
Over 30 participants from civil society from 19 countries in Africa, Asia, Europe and Latin America, representatives of non-governmental organizations, people’s movements and academia joined together from the 3rd to the 6th of March 2017 in Berlin. Review, discuss and prioritize the contributions and recommendations of the online compendium in the light of the experience of the participating organizations. Strengthening international networking and cooperation. Develop a civil society declaration that will feed into relevant processes at national and international levels. Develop a road map of activities in regard to the 2017 International Year of Sustainable Tourism for Development and beyond. Participants of the meeting from left to right: Marie Kosche, Laura Jäger, Ma Rosalie Abeto Zerrudo, Herman Kumara, Maria Youngsin Lim, Antje Monshausen, Ernest Canada, Marina Novelli, Yves Bowie, Marianna Madueira, Diana Sachon, Christina Kamp, Helena Myrman, Cesare Ottolini, Frans de Man, Ko Nyunt, Humberto Rodríguez Mercado, Adama Bah, Mark Watson, Om Sophana, Sumesh Mangalasseri, Rebecca Armstrong, Andy Rutherford, Kevin Curran, Kartin Karschat, Libby Blake, Claudia Mitteneder, Vin Khai, Theo Noten, Mechtild Maurer, Christine Plüss, Matías Bosch, Ana, Juhee Shin, Mamadou Mboji.